The Dominican Republic has a bit of a reputation as the poor man's Caribbean. It conjures up images of resort after resort full of loud, rowdy tourists caning the pre-mixed pina coladas like they're going out of fashion. All that is changing, though – if it was ever really true in the first place. For a start, British Airways now has a twice-weekly direct flight to Punta Cana from London Gatwick – perfect for those who wouldn't be seen dead on a charter flight. The world's favourite airline doesn't fly to just any old resort, so it's a sure sign that those cheap and cheerful buffet 'n' booze package paradises have been joined by a set of upmarket hotels catering for a more discerning crowd. My destination for the week was Paradisus Palma Real, owned by uber-cool hotel brand Meliá Hotels International, so I was expecting good things. What I didn't expect was quite the level of luxury and sophistication on offer – not just for couples but for little ones too. Paradisus offers a Family Concierge service and this is what really sets it apart for a family-moon. The Palma Real resort has just had a £7.5million renovation, which included a new private lounge for families, a trattoria-style restaurant and bar exclusive to Family Concierge guest, private beach and fun Kid's Zone. There are also 42 new luxury suites, which include a dedicated concierge and child-friendly amenities. After I'd checked in at the lounge – no hanging around at reception desks here – Juan, essentially my own private butler, showed me to my Ocean View Junior Suite. If I'd been 10 years old I would've run around the huge space squealing with happiness, but I contained myself as he showed me the freestanding bath, double shower, enormous bed piled with fluffy pillows and, best of all, the large balcony with outside Jacuzzi. He then handed me a mobile phone programmed with his number so I could call for him any time (“you want a Jacuzzi, I come and run it for you”) and left me to enjoy the gobsmacking view over to the lapping waves of the Atlantic Ocean. Then I ran around squealing with happiness. This is no ordinary all-inclusive resort; like many of the new generation of fancier hotels here there's a selection of gourmet restaurants, classy bars and nightlife destinations. No pre-mixed cocktails, either; at the cool M-Bar a mixologist specially brought over from Spain made us a selection of incredible drinks that compare with any I've had in trendy city bars, while the Gabi Beach Bar served us Ibiza-worthy concoctions as we gazed out at the blue water. Children don't have to miss out on the fun – at MIX, the Family Conciergeexclusive bar, you can drink local favourites while they enjoy alcohol free drinks like the Satis-factio, featuring ingredients such as pineapple, apple, ginger and honey. This is where the hotel really hits the jackpot; you want your honeymoon to be a once-in-a-lifetime dream experience, but if you're taking the kids you might feel you have to compromise. Not so here; their – and your – every whim is catered for beautifully. Only one restaurant is not in the all-inclusive package; Passion by Martin Barasategui, a seven-Michelin-starred Spanish chef. It's an adults-only restaurant; however – and this is my favourite detail – if you book a romantic meal à deux here, a babysitter is included. That's right, someone else will entertain your children and put them to bed while you indulge in the à la carte or – my recommendation – the stunning tasting menu, with matching wine flight. They can eat pizza in the suite and play on their in-room games console while you have a wildly gastronomic experience at a restaurant voted number one in the Caribbean in 2013 by TripAdvisor reviewers. What you really come to the Caribbean for, though, are the beaches, and Punta Cana certainly delivers. Paradisus Palma Real is based on the gorgeous Bavara Beach, an almost ridiculously beautiful stretch of white sand complete with waving palms and plush sunbeds. Paradisus also has another hotel here, the Paradisus Punta Cana, which is a little further round the bay on a stunning section of the same beach. The water is a little calmer here, so if your children are very tiny this might be a good place for you – it also offers the Family Concierge option and is a more spread-out resort, with bungalows and low-rise buildings scattered through lush, tropical gardens. Guests are given bikes to get around on, or you can hop on a golf cart through the mangroves. At both properties there are beautiful pools and lovely kids clubs with games consoles, a baby room packed full of tempting toys, a snack area just for little ones and outdoor play equipment, plus activities every day such as rock climbing, tennis lessons, pool games, crafts and pizza making. You can drop the children off there and head to the gorgeous YHI spa, where, if you're not relaxed enough yet, you can enjoy world-class treatments to soothe and energise you. Tempting though it is to stay in your little resort bubble, it would be a shame to fly halfway around the world and not see anything of the surroundings. In nearby La Romana you can tour the local baseball stadium – the national sport here and a big passion for Dominicans – or take a trip to Higüey to see the wondrous modern Basilica la Altagracia, a vision in concrete and the focus of annual pilgrimages. Around an hour away is the curious Altos de Chavon, a recreation of a Medieval European village built in the '70s, complete with an amphitheatre which has hosted concerts by Frank Sinatra, Julio Iglesias and the Pet Shop Boys. Perhaps most interestingly, it's home to an on-site design school, La Escuela de Diseño, which has become a pioneering home of art and design. I'd also recommend a boat trip down the Chavon River – where movies such as Apocalypse Now, Jurassic Park and Rambo: First Blood Part II were filmed. We feasted on lobster and rum while watching butterflies flit out of the surrounding jungle, before the tables were cleared out of the way so we could dance all the way back. Back at the ranch, as it were, all we had to do was decide which of the many tempting restaurants to eat at and which pool to swim in. The clever design of the resort meant that, even though around 80 per cent of its 526 rooms were occupied – there are also 168 suites at The Reserve, a boutique hotel-within-the-hotel – it never felt busy. There are nooks and crannies everywhere, with quiet little corners to make your own. Paradise indeed – whether you're bringing the kids or not. 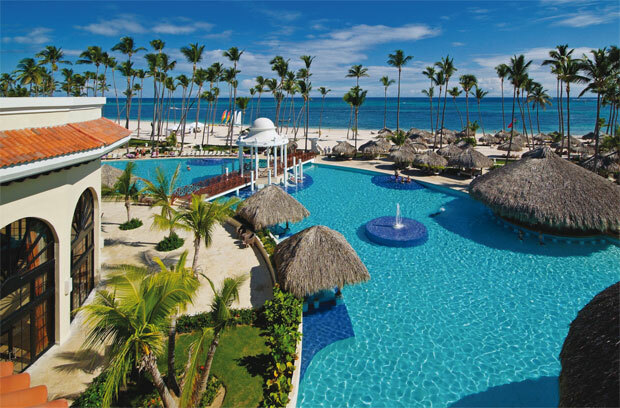 Punta Cana is around nine hours from the UK, with direct British Airways flights available from London Gatwick. The currency is the Dominican peso, but in the resorts American dollars are widely accepted. Family concierge rooms at the Paradisus Palma Real start from £360 per person per night, all inclusive. 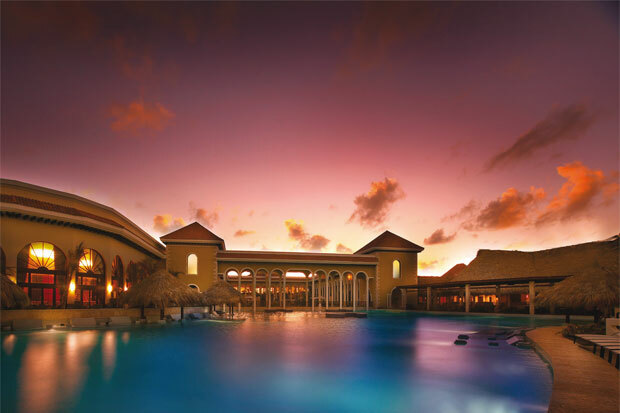 Paradisus Resorts has been awarded EarthCheck Silver Certifi ed status – gained by reporting its environmental footprint to independent auditors and adhering to an internationally recognised standard of best practice. 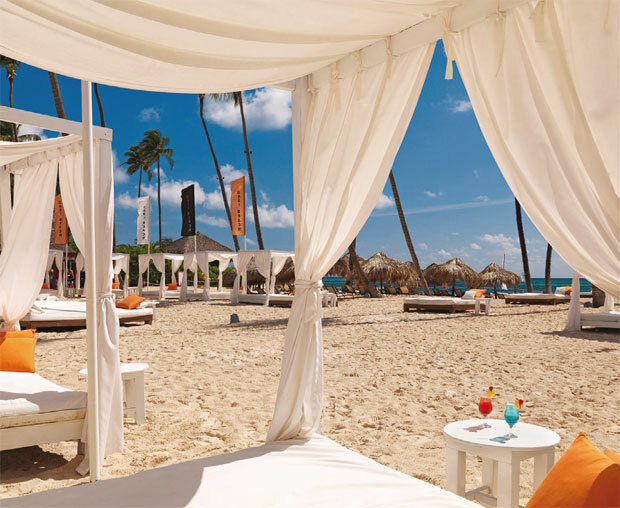 Paradisus Palma Real and Punta Cana both have International Blue Flag Beach and Marina Certifi cation.